With the introduction of Google+, Google has introduced a way for authors, both high and low profile, to stand out in search results. Why? What’s wrong with current search results? Well, it turns out people trust certain sources of information more than others. The markup allows users to see the name and profile picture of a link source. So if you’re a well-known author, it lets Google searchers see that authors name and profile picture, enabling them to quickly make a decision as to the quality of the link. Google wins because it gets authors to use their new Google+ service, plus it requires the author to link back to Google. There is a lot of misinformation on the Web about how to set up the links and establish the relationships, so I am outlining a process with some tips to get you started quickly. Each page of content needs tagging to establish the link to an “author” page on the domain. 4. A link in your Google+ profile in the About section to your About page on your domain. Google organized the Google+ profile wire up, so now links to publications and blogs can appear under a “contributor to” heading. Great for authors that have content on multiple sites / blogs. There’s also a shorter way if you don’t have full control over your web page. It uses just a regular hyperlink. Only recommended if this is your only option. I personally haven’t had great luck with this method as of yet. 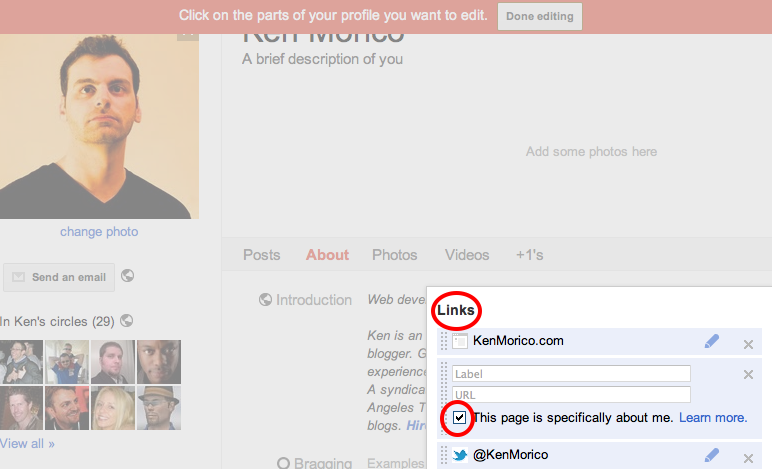 You’ll need to verify link relationships after you’ve set up the Google+ profile and the buttons on your site or blog. 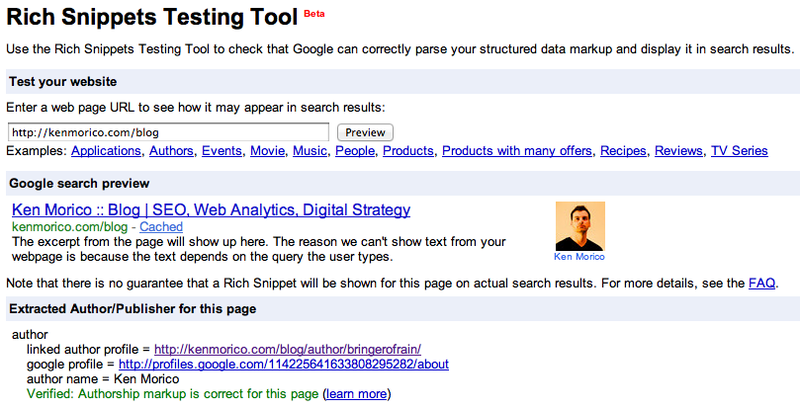 Luckily Google makes this easy with their Rich Snippets Testing Tool. Just enter your URL and you’re good to go. If you have multiple authors writing for a blog you need to tweak WordPress for Google authorship markup. Also, I tweaked my blog to show my bio after each post, so I need this tweak as well. Create a page in WordPress that is a custom author page. Link the custom author page to the author’s Google Profile with rel=”me” attribute. Add a link from the Google+ Profile to the custom about page using the “contributor to” section or “other profiles” section. 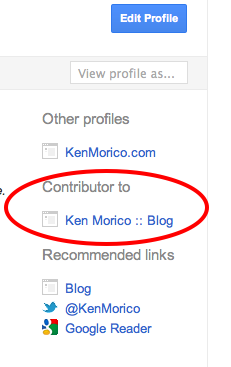 Optionally add a link from the Google+ Profile to the site homepage under the “contributor to” section. It’s important to have rel=”me” because WordPress creates an author page for each user and having this extra page creates a problem with the standard rel=”author” markup. See steps above to create a custom about page. Since profile photos are going to appear next to content links on Google search results pages, it makes sense to get a professional of yourself. Nowadays almost everyone knows someone with a DSLR camera, so you can probably get a session with a friend of yours. That will allow for more creative options and more time getting the right shot. You and your content will be competing with the big boys, so be prepared. How Long Does it Take to Get My Picture Associated with Content? Google is slowly rolling out the picture and profile hookup. According to research I’ve done, even if you implement everything correctly, there’s no guarantee that Google will associate your picture and author profile with your content. I have been noticing more and more pieces of content with author profiles, however. Googlebot works at Googlebot’s pace. You can’t get Googlebot to index your site faster, or get it to index all pages on a site. It would seem to me Google would only highlight relevant authors and low-quality authors would be treated like low-quality content. Kind of cold, but dem der da facts. As you can see, the listing with the author image really stands out with next to the other listings. What’s great about the authorship markup is that it could be used for any content – images, video, etc. 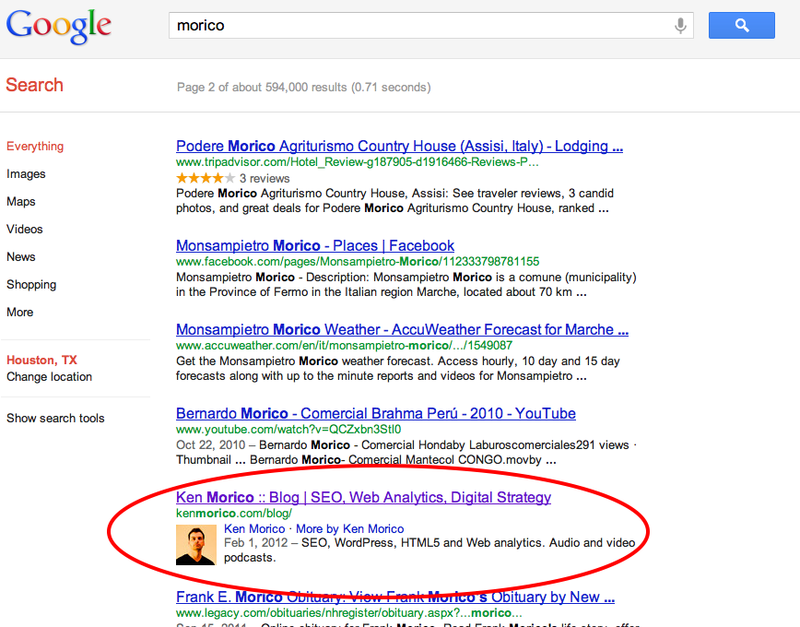 Google+ posts seem to have author information visible in search results. That’s an incentive to post to your Google+ account. When you post in Google+, you can link to your own Website and drive traffic that way. With personalized search, this gives you an edge you wouldn’t otherwise have. Use it to your advantage. Get on it and get promoted! the search the better your result.